The posters in the Nottingham collection are both TASS windows and printed posters, representing two very different methods of poster making. The window artists are dealt with first, followed by the print artists, each group in alphabetical order. These brief biographies are intended to place the artists in context. They show a wide spectrum of training and experience in the art world, indicating the sheer range of skills that was brought to this war work. Occasionally, very little is known about an individual artist. In these cases a short discussion of their contribution to the TASS enterprise is made, based on the works from the collection available on the website. As conservation and digitisation of more posters is undertaken and research into the Nottingham Collection continues, the information on these pages will be extended. 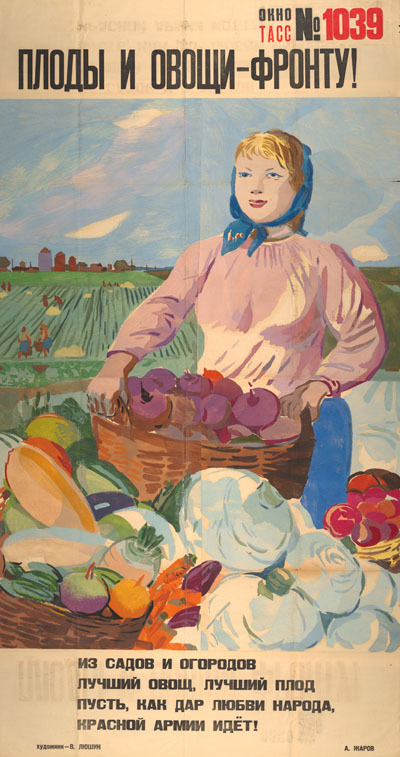 Fedor Antonov (1904-1990), undertook his initial arts training until 1920 in Tambov. He aimed at a career as an industrial artist, and enrolled at the State Art School, VKhUTEMAS, in Moscow, 1922-27. He won a gold medal in 1927 at Milan for his work, mostly focused on textile design. He subsequently developed skills as a painter, a portraitist and recorder of open air scenes, often marked by sentimentality. 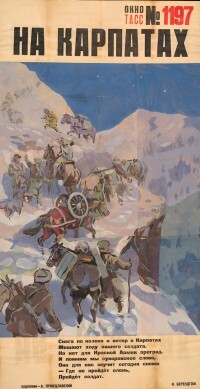 He continued exhibiting in the 1930s, and then produced a range of printed posters and portraits of war heroes from 1941. In the 1950s and 60s he developed as 'Soviet impressionist', for which he is valued internationally today. 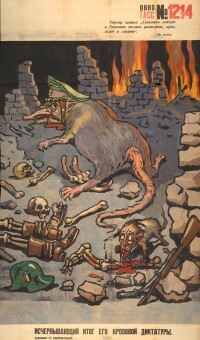 He produced 18 TASS posters, one of which is in the Nottingham Collection. It is sentimental and religious, but shows a modern woman. Mikhail Cheremnykh (1890-1962) trained under Korovin and Maliutin in Moscow before and during the Revolution. 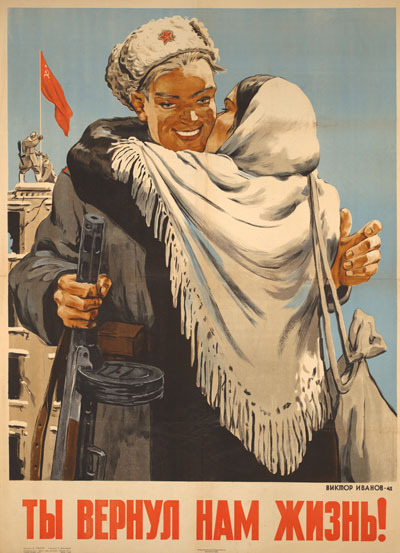 He was a founder and active contributor to the ROSTA windows in the early 1920s, then went into propagandist poster work and worked in the popular press. In the 1930s he also worked as a book illustrator and theatre poster designer. 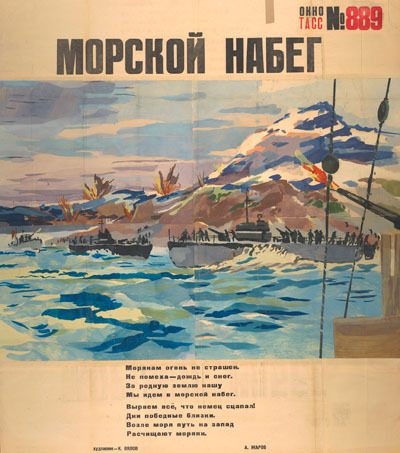 After the war he taught poster design at the V.I Surikov Art School in Moscow. A founder member of the TASS Windows (there are 6 examples of his work in the Nottingham collection), he drew on his graphic skills. 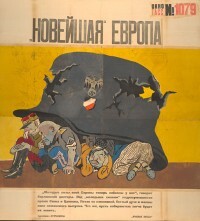 He turned to both heroic (home front) and satirical (the enemy) themes, sometimes combined comic strip fashion, in the same poster. He created around 40 Windows in all, and also carried out administrative and organisational work. Sergei Kostin (1896-1968). As well as taking a course at the State Free Arts Workshops (GSKhM )just after the revolution, where Malevich was a teacher, Kostin studied privately. After stints in a toy workshop and as a graphic designer for the State Publishing House (Gosizdat) and work on international exhibitions (Paris and Japan) he became a stage designer. After the war he built his reputation as a painter as well as a teacher. His work for the TASS windows amounted to 59 designs, of which the Nottingham collection has 9. 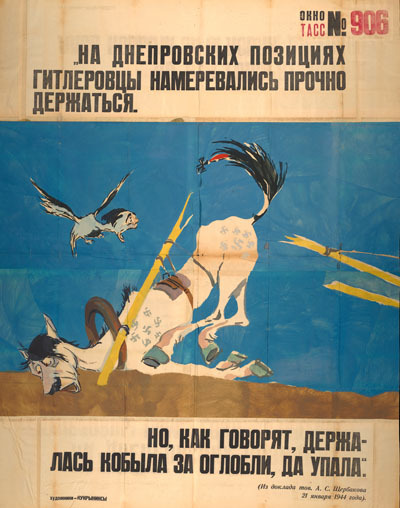 Kostin is both angry and satirical and animals suffer in his hands: a German eagle is brutally speared by allied flags (TASS 1235), while a sheep and a wild beast are joined together but fruitlessly strain against each other (TASS 903). The Kukryniksy is a collective of three, the name being based on a combination of their surnames: Mikhail Kupriianov, Porfirii Krylov and Nikolai Sokolov. 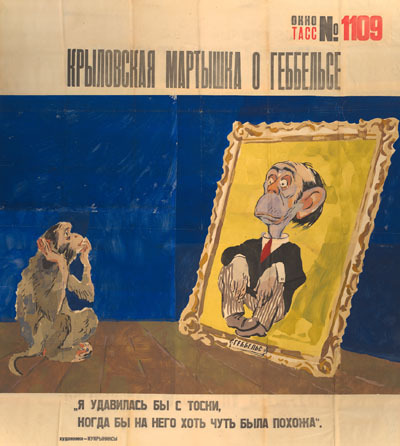 They met as students in the early 1920s, united in their interest in the new Soviet art of visual propaganda. They worked under Dmitrii Moor (1893-1946), a creator of the ROSTA Windows and an acknowledged founder of Soviet poster design. 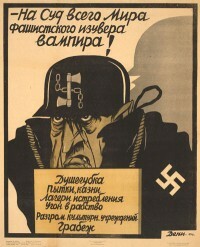 The Kukryniksy became well known as political poster artists in the 1920s and 1930s. Their vicious treatment of their targets was put to good use in WWII in the TASS Windows. 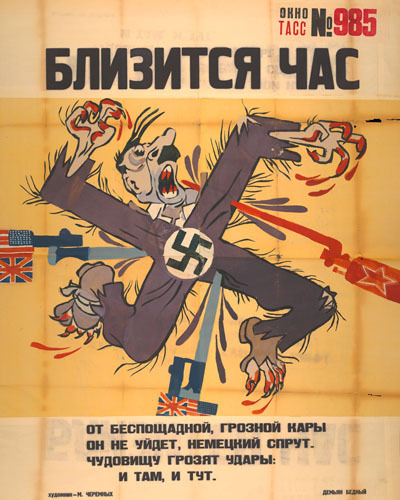 It was largely their images, found in 66 of the complete series of Windows, which created the Russian view of the Germans as a bestial enemy, with Hitler as their rodent-like leader. They created 13 of the posters in the Nottingham collection. 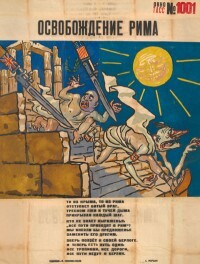 They also collaborated with British war poster artists and some of their work was reproduced abroad (see The Spirit of the Soviet Union (London, 1942). 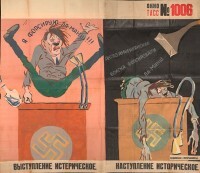 The Kukryniksy did not balk at violence, usually combining it with a grotesquely comic edge, for example in their image of Hitler caught by pincers (TASS 993). 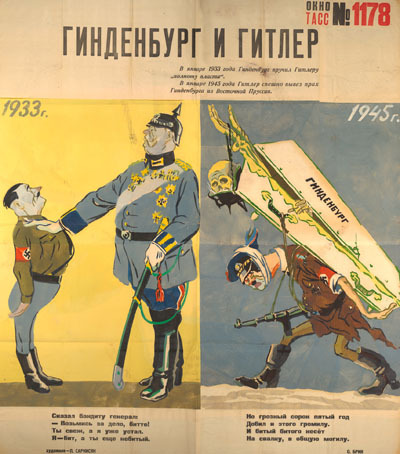 A comic strip contrasts ebulliant and deflated Hitlers: his delivery of an hysterical speech is followed by his reaction to the Anglo American landings in France (TASS 1006). Vladimir Lebedev (1891-1967) studied on the eve of WW1 in Petersburg at the Academy of Arts, where he also taught later in the Civil War (1918-1921). He worked on the satirical journals Satirikon and New Satirikon. He was one of the founders of the ROSTA Windows in Petrograd, and produced more than 500 in one year, 1920-1921. His style in the 1920s combined cubism with the popular print (lubok), and he experimented with new forms in portraiture and still-life. He was also an illustrator of children‘s books, among the best known of which was Marshak‘s Mister Tvister (1933). In the mid 1930s, he was criticised for his work and labelled a 'formalist', for not operating in the spirit of socialist realism. He became a major contributor to the WWII TASS windows creating 40 items. Liushin (1898-1970) trained at the Moscow Stroganov school from 1913, and after the revolution graduated from BKHUTEMAS (Higher Artistic-techical Studios) in 1924. He was an early member of the Society of Easel Painters (OST) which existed from 1925-1931. Liushin exhibited with them. Information on this master of horse painting remains elusive. The Chicago on-line catalogue gives only his birth date as 1875, and nothing further has emerged. He is responsible for 7 posters in the Nottingham collection. His skills at painting horses drew him to military warfare (see TASS 1163, 1146 1209), to partisan pursuit of the enemy (1021) to a rescue against a backdrop of devastation, (1115) and to the Carpathian mountains (1197). Window 1021 (21 August 1944) and 1209 (26 April 1945) are the earliest and latest examples of his work, suggesting, perhaps, that Przhetslavskii's association with the TASS project was concentrated into the last few months of war, though he was nearing 70 by this time. Petr Sarkisian (1922-1970) was one of the younger members of the TASS Windows team, joining fresh from his Moscow training in 1942. He returned to study after the war, specialising in cinema. He then joined Soiuzmultfil'm, the state enterprise specialising in cartoon films, becoming a director in the 1960s. His work for TASS shows not only cartoon but strong painterly and composition skills. 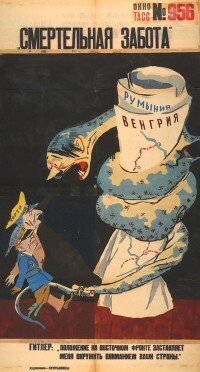 His representation of the enemy army as a hydra became our signature image for the first exhibition in 2008-09 (TASS 1211). His work in the Nottingham collection (total of 12 posters) rarely deals with the heroic, except in the days of victory in 1945. He portrays Hitler in a number of guises, including his confrontation with a noose. Pavel Sokolov-Skalia (1899-1961) studied in Moscow in WW1. He was artistic leader and designer for the TASS Windows in WWII. He was responsible for 16 items found in the Nottingham Collection. His contribution to the whole series was immense ( about 200 posters (Windows on the War, 2011, p386) and his skills as a stage designer and illustrator as well as painterly skills are much in evidence. For example, compare TASS 939, 1001 and 1214, which capture their moments of action as if on a stage set. 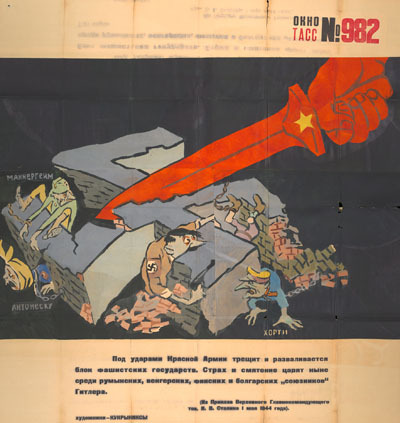 From 1945 he also designed victory posters (see TASS 1236). 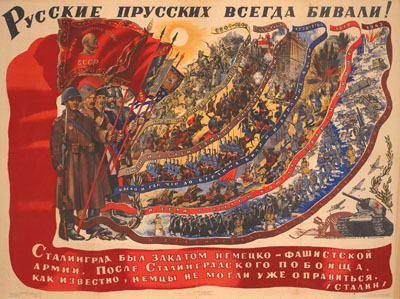 He taught in various institutions in the 1940s and 1950s, and later designed several panoramas, for example of the Crimean War (1954). He is acknowledged for his work as a painter, stage designer, and book illustrator, and was awarded two state prizes in the 1940s. Mikhail Soloviev (1906-1990) studied in Moscow after the 1917 Revolution. 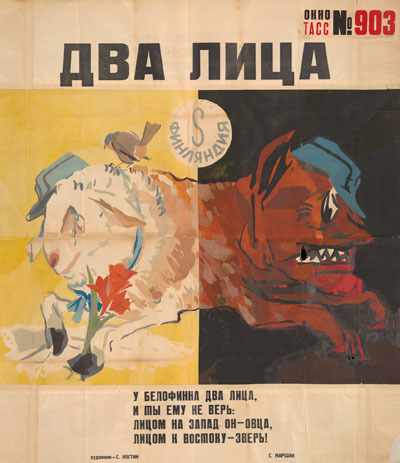 In addition to his poster work, he was also a painter, stage and journal designer, and a member of the Soviet Academy of Arts. 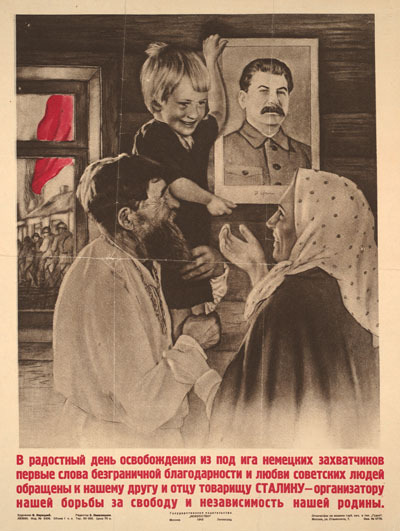 Biographical details are elusive: despite two Stalin Prizes for work as a poster and Windows artist in the 1940s, he does not figure in Soviet reference works. 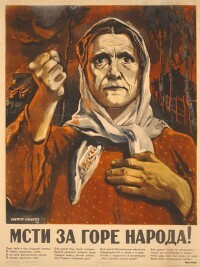 A rare citation is found in Maria Lafont, Soviet Posters. The Sergo Grigorian Collection (2007, p. 284). 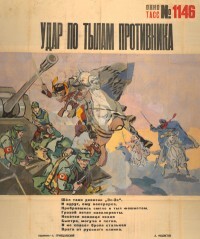 His poster work mainly takes military themes, celebrating various Russian victories and the depiction of soldiers, as shown in TASS posters 641 and 1253. He is responsible for another 12 posters in the Nottingham Collection. (2011, p.386) attributes 157 posters to him between 1941-46. Konstantin Vialov (1900-1976). After studying at the Stroganov School for technical drawing during WWI, and then after the revolution studying under Kandinsky and Tatlin, Vialov became known as a part of the new Soviet avant-garde in the 1920s. He painted and designed (eg book covers) in the spirit of Constructivism, then adopted a more representational style under the impact of Socialist Realism in the 1930s. He designed 26 TASS Windows. 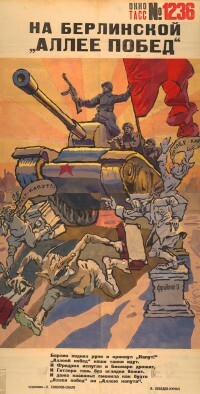 Nottingham has 3 of his designs, two seascapes, and the third on Soviet reconstruction. Currently, he is an artist and designer whose works are still sought after. He is another example of an artist who worked in stage design contributing to the dynamic spatial and often performative techniques seen in the Windows . Aliarkrinskii (1892-1961) trained in Moscow, and worked as a cartoonist and graphic artist on theatre for Moscow journals before WWI. While teaching in Iaroslavl during the Civil War he organised a local ROSTA Window operation. He worked on a number of Soviet journals in the 1920s and 1930s and as a book illustrator, then and for much of the rest of his career. 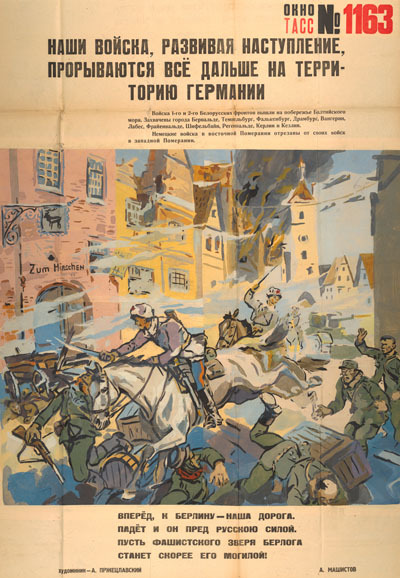 In WWII he contributed to poster art, producing The Russians have always beaten the Prussians print, the only example of his print work in the Nottingham collection. Also a painter, he exhibited abroad in Leipzig (1927), and Amsterdam (1929). Deni (real name Denisov) (1893-1946) studied with N.P.Ulianov, himself a pupil of the portraitist Valentin Serov. 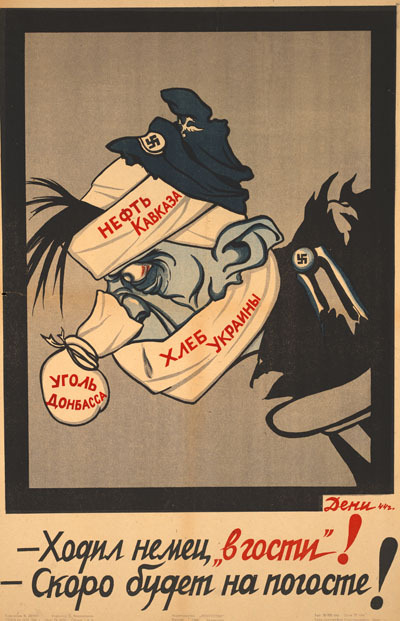 Deni began his career before WWI working on humorous journals such as Budil'nik (The Alarm Clock), Satirikon, Solntse Rossii (Sun of Russia). After the revolution he worked on the ROSTA windows and for the newspaper Pravda. He became a poster artist in the 1920s and 30s. His work is very distinctive for its harsh political satire, and he is acknowledged as one of the key figures of Soviet political poster art. 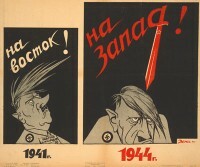 Deni is noted for his caricatures of Hitler in the WWII prints. His prime skills are as a graphic artist and portraitist. 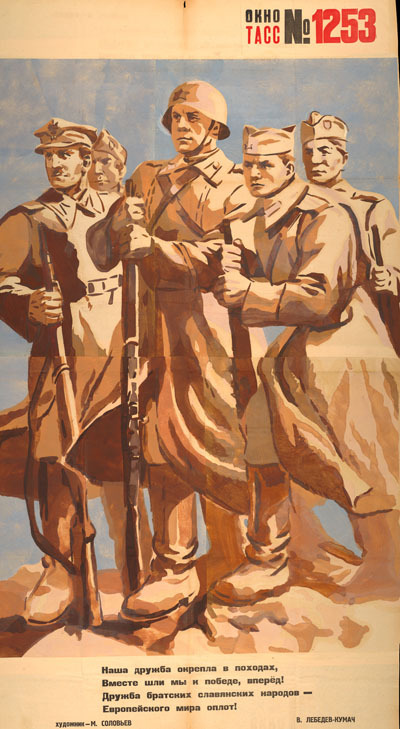 His use of colour is sparing and was constrained ever more by the scarcity of colours in the war. By those tokens, however, his work is always sharp and uncluttered, even harsh, in its satirical approach. In the 1920s, Ivanov (1909-1968) studied at the Iakub Moscow State Technical School of Arts, transferring in 1929 to the Leningrad Academy of Arts School of Painting, Sculpture and Architecture. 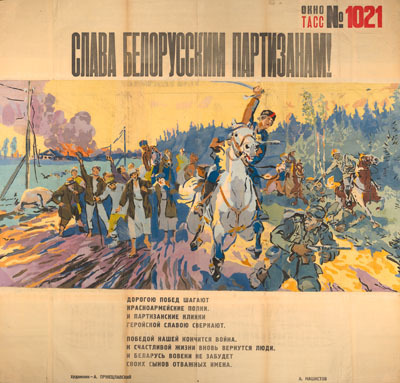 In the 1930s Ivanov worked for Izogiz (Fine Art State Publishing House) producing soviet political posters. 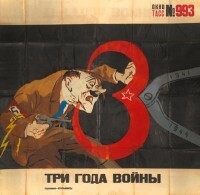 He contributed to the TASS windows series from 1941-1944, while also producing printed posters. The Nottingham collection holds three of his prints but none of his 19 TASS windows, from the early war years. Koretskii (1909-1998) studied at the Moscow School of Arts in the 1920s, from being a teenager onwards. He first specialised in portraits of artists, and then in 1930s moved into the burgeoning world of the political poster, working for the publishing house Izogiz. As demonstrated in the example in the Nottingham collection, his work is marked by the incorporation of photographs into his posters. 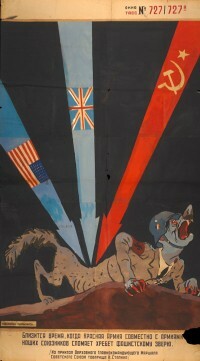 During WWII he produced more than 40 printed posters. He is also known for his designs being used for stamps on war-related themes. He received the Stalin prize twice in 1946 and 1949 for his work. 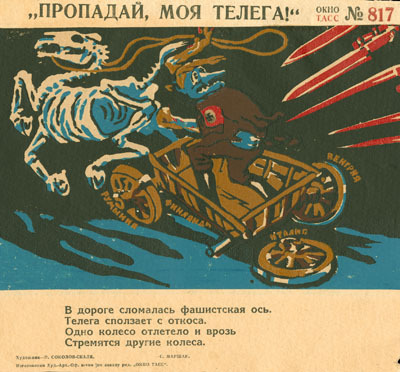 From the fifties he worked for the Soviet organisation ‘Agitplakat’ (Agitational posters). Vatolina (1915-2002) studied from the mid to late 1930s in Moscow with both Deineka and Deni, who were well known as artists and poster designers. 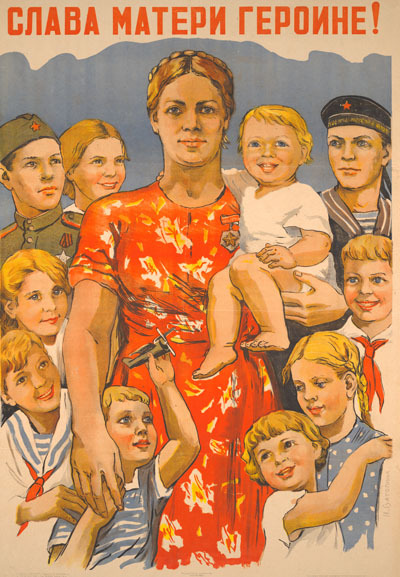 She produced a series of political posters including the well-known Don’t gossip! 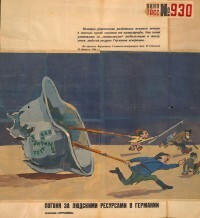 (1941), which perhaps unfairly targets women. In Don’t gossip! a vigorous looking woman holds her finger to her lips, a contrast to the monumental mother figure portrayed in Our Mother-Heroines! (1944). 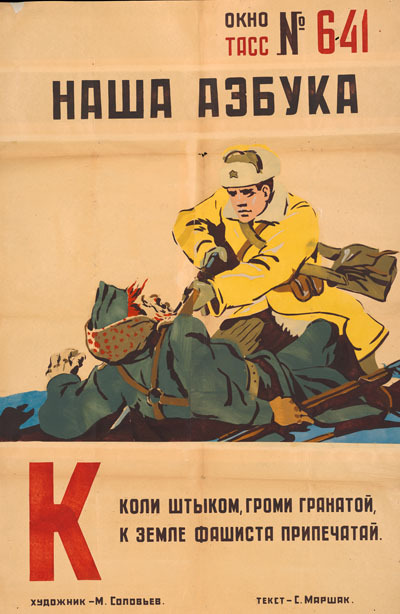 Vatolina continued to design posters after the war, mainly on themes directed at women. She was also a painter and had two major exhibitions in Moscow in the 1950s and 1960s. 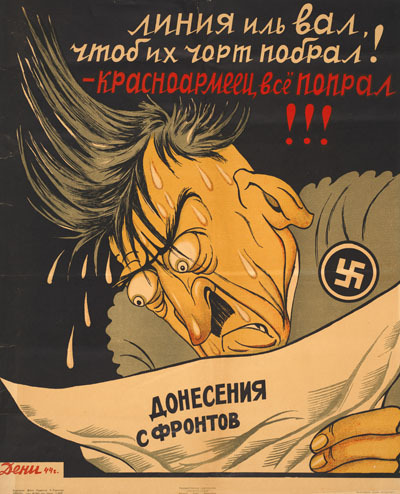 “he Great Patriotic War of 1941-1945”. Tank column. 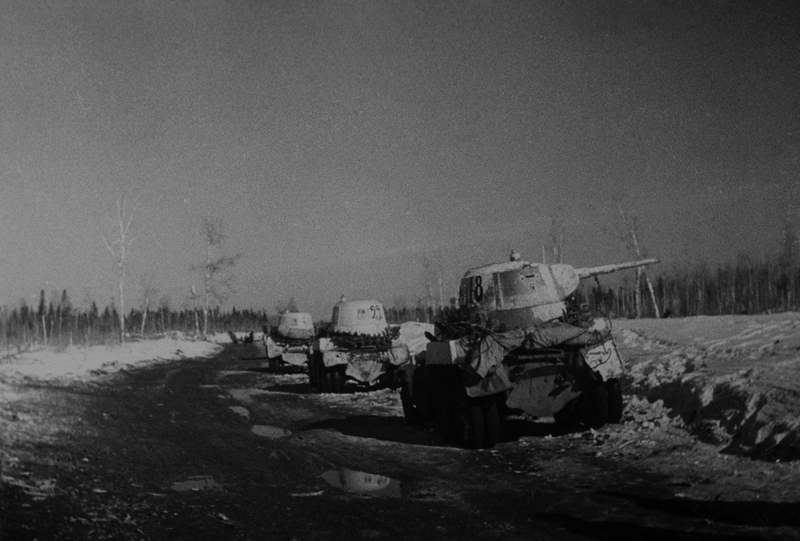 Leningrad Front breakthrough.